The Science and Technology Demonstration Center is called Pusat Peragaan IPTEK (Ilmu Pengetahuan dan Teknologi) in Bahasa Indonesia. This is a must visit place in TMII, because it introduces science and technology in a fun and entertaining way for the whole family. There are 300 exhibition tools that can be touched, held, and played with. They are divided into several categories. Electricity and Magnet, Robotics, Ozon, Math, Energy, and Dinosaur are some of them. They are all prepared for kindergarten up to high school levels. 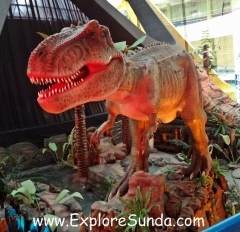 It also has a special room called Arena Peneliti Cilik (Young Scientist Arena) for children under 5 years old, where they can learn while playing in scientific games. You also can watch scientific movies in the auditorium. One of the interesting attraction is the demonstration of water rocket. It performs six times daily. Istana Anak-Anak Indonesia is also known as The Indonesian Children Palace in english. It looks different from other buildings in Taman Mini Indonesia Indah since it looks like a Cinderella castle with two wings and a high tower, but in the inside it exhibits wayang (Indonesian puppet) and various Indonesian traditional games. It also has diatonic and pentatonic musical instruments. Your children will enjoy exploring and participating in games, either inside the palace or in the front yard as well as the back yard. Children also can take rides in several outdoor attractions, such as monorail, bumper car, kiddy boat, fancy animal, airplane and ball pool. It even has a children swimming pool! But we must buy tickets for each attraction. If your children interested in dancing or singing, there are weekly courses of Indonesian traditional dances and vocal here. They even have courses on pedalangan (the story teller in wayang puppet show) and Karawitan Jawa (singing in Javanese language). All courses are for children. There are 2 theaters in TMII, they are unique in their own way. The first theater in TMII is Keong Emas (Golden Snail) IMAX Theater. You can find it easily since it has the shape of a giant golden snail. Watching movies in this theater make us feel as if we were in the movie itself, we feel like we are flying in the air like bird, or suddenly hit the brake in fast moving car. Most of the movies here tell about Indonesian cultures and natures, but sometimes they also provide box office movies. Several years ago I watched Harry Potter: Prisoner of Azkaban here, it was awesome! Taman Mini Indonesia Indah also has a 4D Motion Theater. We must wear special spectacles to watch the movie. Then we will feel as if we were in the movie, plus we also can feel the wind, rain, and some fragrances. Afterwards, we can go to Wonder Adventure behind this theater to do some outbound activities. The Swan Boat is a pedaled boat. We can rent them to sail around Miniature Indonesia Archipelago in the main lake of Taman Mini Indonesia Indah. This is one of the latest recreation facility in Taman Mini Indonesia Indah. It has an artificial beach called Snowbay Beach as if we were in the real tropical beach. You should try other challenging games too such as Hurricane, Flush Bowl, Cool Running and Typhoon River. Younger children also can join the fun in the tot’s pool, play pool or kids’ pool. This water park also provides a restaurant named Captain Jack’s Cuisine, where we can dine without leaving Snowbay. If you like fishing, you can join fishing competition at Telaga Mina fishing pond, which is at the rear of TMII. This is the largest fishing pond in Jakarta, approximately 3,000 square meters. However, we are not allowed to bring home the fishes we catch, because they will be returned to the pond after they are weighed. You win the competition if you catch the heaviest fish. This Giant Balloon is a relatively new ride in Taman Mini Indonesia Indah. It can carry up to 30 people. It will float to 150 meters from the ground for about 15 minutes and we can see the view of Jakarta city. Your children will love the 14 challenging games offered by Warna Alam Outbound Camp. They can walk through the canopy trail, do flying fox, and many more. The location is on the parking area of the Bird Park. Next, click any of the image below to continue reading about pavilions, museums, gardens, parks and facilities in Taman Mini Indonesia Indah.